When the Yankees acquired Curtis Granderson from the Detroit Tigers prior to the 2010 season, many expected the All-Star center fielder to thrive in the New Yankee Stadium, even relative to his excellent tenure in the Motor City. Although 2010 wasn’t a disappointing season by any means — Granderson put up a .346 wOBA and solid defense in center en route to 3.7 WAR — he didn’t realize the power boost that many expected with the move from lefty-suppressing Comerica Park to lefty-friendly New Yankee Stadium. That is, until this season. After a modest 24 homer season in 2010, Granderson has slugged seven quick bombs in 2011, lending credence to those who expected Granderson to go supernova last season but were left disappointed. Even though it took a full year, though, we shouldn’t be surprised Granderson is showing some premiere power. Comerica Park is a pitcher’s park and Granderson has generally had a better ISO away than home. At Yankee Stadium, which might be the best place for lefty pull-power hitters, this should change. 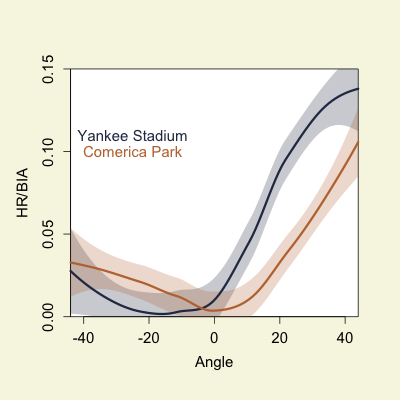 Here is the HR/BIA rate by angle of the ball in play for LHBs in Yankee Stadium versus Comerica Park. Right field, where Granderson hits most of his HRs, at Yankee Stadium has a much higher HR rate than right at Comerica Park. So, Granderson should see a boost to his already solid power in New York. The Yankees got not only a all-star-level player, but one well suited to their park. It wasn’t as if Granderson’s pull power deserted him last season. In fact, Granderson’s HR/FB% to the pull side of the field was a remarkable 48.9% in 2010, fourth among qualified players (trailing only Miguel Cabrera, Shin-Soo Choo, and Derrek Lee) and the highest mark of his seven years as a Major Leaguer. This didn’t manifest itself as a career best in home runs for two reasons. Granderson hit lower in the lineup and received a number of off days to nullify his problems against left-handed pitching, and he hit far fewer balls (and fly balls) to right field overall than in 2009, his 30 home run season which created the vision of Granderson as a power hitter. The 29-year-old’s fly ball percentage to right field was six percentage points lower in 2010 than it was in 2009 and his percentage of balls hit to right field in general was five percent lower as well. Now, in some ways, 2009 was an aberration. His career splits are much closer to 2010 than they are to his powerful 2009 season. However, even with a reversion to less homer-friendly spray tendencies, Granderson still posted a similar number of home runs per plate appearance in 2010. With more time on the field in 2011 — 70 plate appearances already through 19 games — Granderson’s power is able to manifest itself in counting stats as well as rates. Of course, he will cool off — his HR/FB to pull is a white-hot 85.7% right now — but the 30+ home run seasons many envisioned on Granderson’s arrival? They’re possible, and we should see the first in 2011. We hoped you liked reading Granderson Turns Power On To Start Season by Jack Moore! Cool article and I agree with your conclusions, but I’ll just point out that Granderson has actually hit more HRs on the road (4 vs 3) than at home this year despite playing a home-heavy schedule so far. The great news for Yankee fans is his 1.389 OPS against lefties so far. Obviously the sample size is miniscule, but it’s a continuation of where he left off last year after he re-vamped his swing.